Headspace is a shop run by Flow and Craymond in Splatoon 2. It is found to the left of Inkopolis Square, in the center of Galleria. 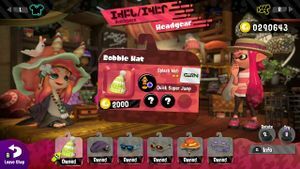 Headspace sells hats, headbands, glasses, and other accessories that can be purchased with cash earned from multiplayer matches and Salmon Run. Players can tilt to rotate their Inkling and click to try on the highlighted item, and pressing purchases this item. Pressing displays further information about the selected item. Pressing zooms in on the player's head, allowing for a closer look at the headgear. Pressing allows players to enter Ye Olde Cloth Shoppe and pressing similarly allows them to enter Ammo Knights, while pressing takes players back to Inkopolis Square. The interior of Headspace, with the background unobscured. Headspace seems to be inspired by Lush cosmetics, given the black board writing, bathbombs, and creams being shown in the background. This page was last edited on 28 February 2019, at 17:52.